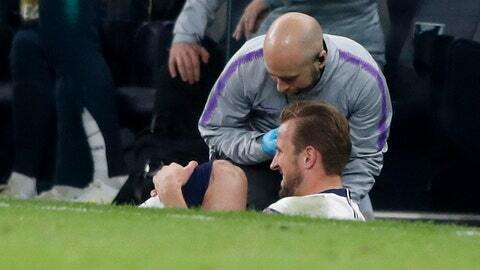 Harry Kane could miss the rest of the Premier League season after Tottenham said Thursday the England captain suffered “significant” ligament damage in his left ankle during its Champions League win over Manchester City. Tottenham did not offer a timeline for the striker’s return from his fifth ankle injury in three years, but there is only a month left in the Premier League as the team fights for a top-four finish that would guarantee a return to the Champions League next season. Kane was hurt making a sliding challenge on City left back Fabian Delph in the second half of Tottenham’s 1-0 victory in the first leg of their quarterfinal on Tuesday. Kane was immediately substituted and limped down the tunnel. A left ankle injury kept Kane out for six weeks across January and February, although he returned two weeks ahead of schedule. Of the seven games he missed, Spurs won four straight league games and beat Dortmund in a Champions League match. Kane has also suffered ligament damage to his right ankle on three occasions since the 2016-17 season. Tottenham’s final Premier League game is on May 12. The Champions League final on June 1 and England’s semifinal match against the Netherlands in the final four of the inaugural Nations League is on June 6. Tottenham had better news on Dele Alli, with the club saying the midfielder fractured his left hand against City but is being assessed to see if he can play in Saturday’s game against Huddersfield in the league. With Kane absent, Tottenham manager Mauricio Pochettino is likely to choose either Son Heung-min or Fernando Llorente as the team’s striker. Son scored four goals in Kane’s absence over January and February. Tottenham is in fourth place with six games remaining.